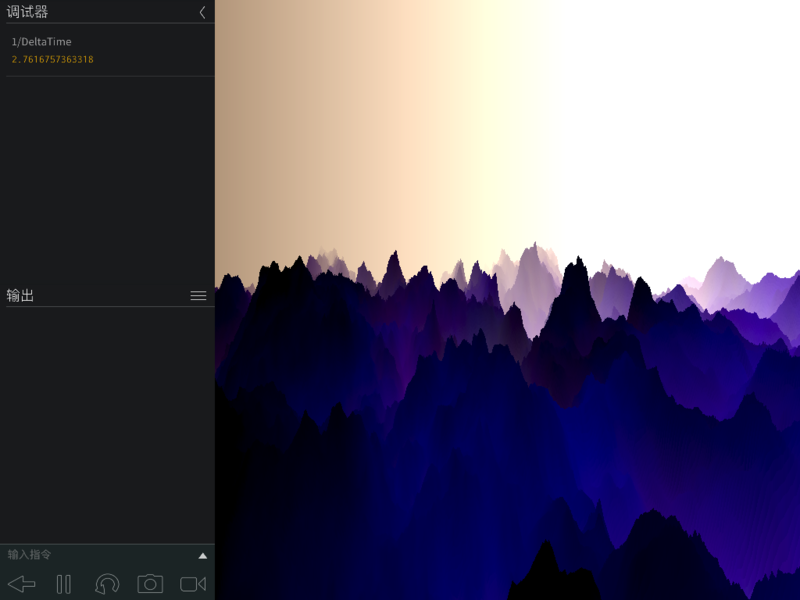 Why Codea`s shader is slower than WebGL`s shader? Today I found an interesting shader in shadertoy (https://www.shadertoy.com/view/llsGW7#), on my iPadPro, I use safari to run it , the FPS is 30~40. I port it to Codea, in ShaderLab, the FPS looks fine, but in Codea code, it is very slow, the FPS become 2~3. In my expect the FPS in Codea should faster than WebGL, but the result is not. I do not know why. Who can help me to analyze the reason, thanks! The tex1 is a 512*512 image, you can use anyone which the size is the same. @yojimbo2000 I was looking at that too, but there's an if statement that breaks out of the for loop. So it not really looping 850 times per pixel. This runs at .9 FPS on my iPad Air. I put a counter in the draw function and increment it by 1. I print the counter value and what I noticed was that instead of printing the counter 1 by 1 each time the image changes, it prints the counter in groups of 3 each time the image changes. So the draw function gets executed 3 times before the shader draws the image which seems strange. I'm using the Small World:Icon as the tex1 image. EDIT: I changed the .002 to .001 in the for loop and the draw counter was printing out in groups of 5 each image change. Going with .0005 caused it to print in groups of 9. I don't know the workings of shaders, so I'm not sure what's really happening with the draw count. For loops in shaders in OpenGL ES I believe get unraveled, even if it's got a break in it. So if it CAN go 850 times, it actually expands the code for the code to do that linearly... It may be that webgl is doing some different style trickery here. Another thing that may be worth trying is upgrade the shader to OpenGL ES 3.0 assuming you have a more modern ipad. This may be the delta between webgl and Codea, as the loop handling in ES 3.0 may have been improved and the webgl is quite possibly running in 3.0 mode. @spacemonkey so openGL ES 3.0 is not the default? How do we tell the shader to use 3.0? But the result(7~8 FPS) is still slower than WebGL. @spacemonkey @piinthesky: I added a OpenGL ES 3.0 version, but the improvement of FPS is small. I tried the code on my iPad Air. The version 2 and version 3 shaders had about the same time. My 1/DeltaTime both gave values about .988 . On mine (ipad pro) I get ~8 fps on the es2, and ~17fps on the es3. @dave1707 : You can try to use a smaller screen size, maybe get a different result. @spacemonkey : The FPS depends on the amount of the calculus, when the screen is multi levels of mountains(kinds of colors), it needs more calculus, the FPS is small; when the screen is one mountain(almost black), it needs few calculus, the FPS will become big, but it will keep a very short period. shadertoy renders out to a very small window in the browser on my ipad pro, and if I were to copy and full screen the same thing in codea it would be rendering at retina resolution. if you refer to the shadertoy app for ios, try hitting the HD button on a shader and that will show you a comparative result to full screen in codea. But the biggest FPS is about 10, can not reach the WebGL`s 30~35. and I am trying to find the reason. The iOS only allow lua run as an "interpret" mode, not a "compile" mode, I guess maybe this make it slow. Can you tell me which speed you can get when you use setContext()? thanks. @binaryblues I don't think gles shaders are compiled (metal shaders are), so in theory that shouldn't make a difference. I think @AxiomCrux has the right idea, upscaling the shader. @yojimbo2000 : What I mean is that the iOS will run Codea`s lua code as an "Interpret" mode, not the shader, maybe this is the difference between WebGL and Codea.